The films that everyone is talking about! YES! You heard correctly. These are the films that have made the Book of Mormon critics speechless. For over 14 years our research has yet to be challenged by ANY anti-Book of Mormon critic. They will not even mention our name, The Nephi Project, in their hate blogs. If anything is mentioned, we are referred to as an "Obscure Church Research Group." You can now visit the best candidate for Lehi's journey on this set of six films on two discs to complete Lehi's journey in the Arabian peninsula. Tell your friends! 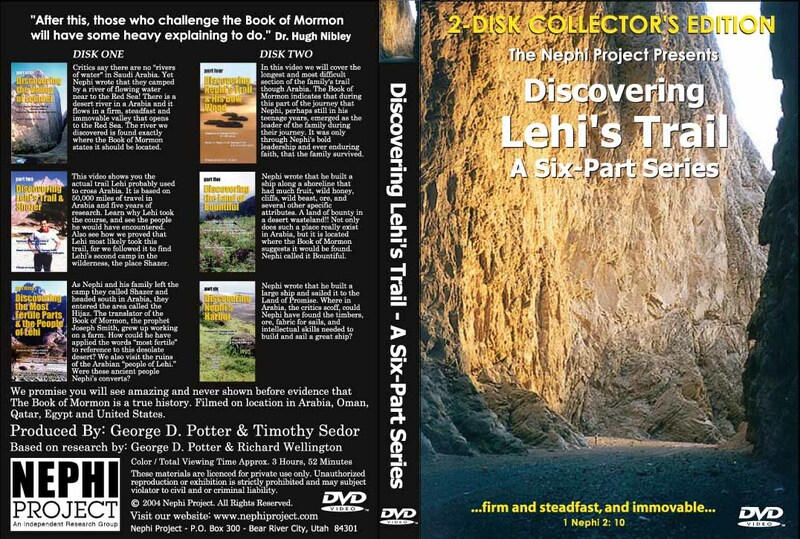 Get the DVD, Discovering Lehi's Trail - A Six-Part Series. George Potter introduces his latest book, Nephi in the Promised Land with a DVD to share his most compelling argument for his candidate, Peru - The Land of the Book of Mormon. 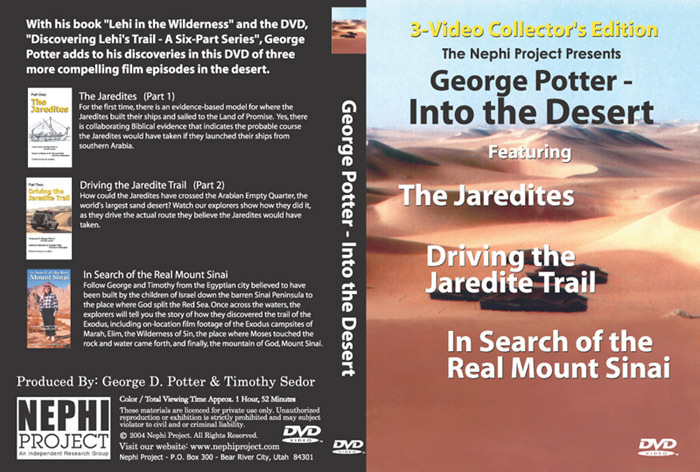 Also a must see, The Jaredites (Part One) and Driving the Jaredite Trail (Part Two) describes George Potter's theory on the Jaredite trail. You will find it most interesting. To really push the envelope we went to Egypt to hopefully settle the Exodus crossing argument, In Search of the Real Mount Sinai. George Potter continues his research in The People of Lehi, a new DVD that includes three documentary films. 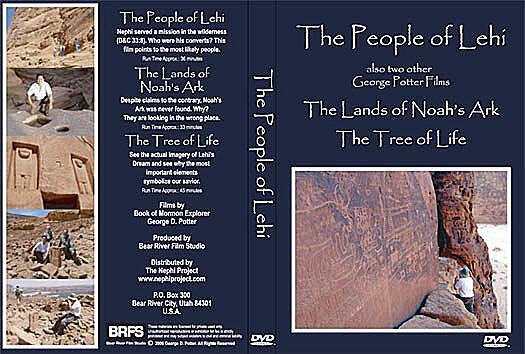 Included on the DVD are the documentary films: The People of Lehi, The Tree of Life and The Lands of Noah’s Ark. All films are in English and are not captioned. Apologize no more. Critics say there are no "rivers of water" in Saudi Arabia. Yet Nephi wrote that they camped by a river of flowing water near to the Red Sea! There is a desert river in a Arabia and it flows in a firm, steadfast and immovable valley that opens to the Red Sea. In fact, the perennial river we discovered is found exactly where the Book of Mormon states it should be located. Discover in this film how George Potter, Tim Sedor and Bruce Santucci used Nephi's instructions to discover Lehi's trail to the Valley of Lemuel. Our discovery was featured in the FARMS/BYU Journal of Book of Mormon Studies in November 1999. This film shows you the actual trail Lehi probably used to cross Arabia. It is based on 50,000 miles of travel in Arabia and five years of research. Learn why Lehi took the course, and see the people he would have encountered. Also see how we proved that Lehi most likely took this trail, for we followed it to find Lehi’s second camp in the wilderness, the place Shazer. Is it possible to find a remote desert campsite 2600 years after Lehi passed that way? Watch this film and see! As Nephi and his family left the camp they called Shazer and headed south in Arabia, they entered the area called the Hijaz. The translator of the Book of Mormon, the prophet Joseph Smith, grew up working on a farm. How could he have applied the words “most fertile” to reference to this desolate desert? In this film you will see why we have yet another witness to the truthfulness of the Book of Mormon. We also visit the ruins of the Arabian “people of Lehi.” Were these ancient people Nephi’s converts? In this film we will cover the longest and most difficult section of the family's trail though Arabia. The Book of Mormon indicates that during this part of the journey that Nephi, perhaps still in his teenage years, emerged as the leader of the family during their journey. It was only through Nephi's bold leadership and ever enduring faith, that the family survived. When the Book of Mormon was published in 1830, Arabia was known exclusively as a barren desert land. Yet Nephi wrote that he built a ship along a shoreline that had much fruit, wild honey, cliffs, wild beast, ore, and several other specific attributes. A land of bounty in a desert wasteland!! Not only does such a place really exist in Arabia, but it is located where the Book of Mormon suggests it would be found. Discover in this film an incredible valley that the Arabs have called a paradise. Nephi called it Bountiful. Nephi wrote that he built a large ship and sailed it to the Land of Promise. Where in Arabia, the critics scoff, could Nephi have found the timbers, ore, fabric for sails, and intellectual skills needed to build and sail a great ship? Book of Mormon scholars have suggested several sites for where Nephi built his ship. However, the critics have easily dismissed these sites as not having had the essential materials needed to actually build a ship. So how and where did Nephi build his ship? George Potter and Richard Wellington traveled to southern Arabia and discovered the answers to these questions. See for yourself the probable harbor where Nephi built his ship. 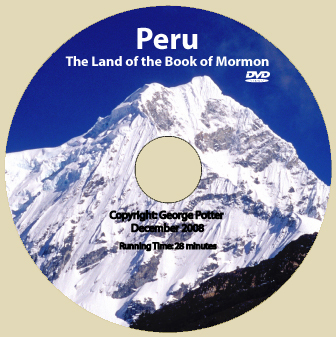 George Potter's newest DVD, Peru - The Land the Book of Mormon. See why Peru is by far the best candidate for the land of the Nephites. New archaeological discoveries in Peru show how the history of the Andes is remarkably consistent with the Nephite civilization and its religion. 28 minute documentary. For the first time, there is an evidence-based model for where the Jaredites built their ships and sailed to the Land of Promise. Yes, there is collaborating Biblical and historical evidence that a people called the Jaredites crossed Arabia, built ships and sailed away. This film explores the available evidence that supports this model and shows you the probable course the Jaredites would have taken if they launched their ships from southern Arabia. How could the Jaredites have crossed the Arabian Empty Quarter, the world's largest sand desert? Watch our explorers show how they did it, as they drive the actual route they believe the Jaredites could have taken. Follow George and Timothy from the Egyptian city believed to have been built by the children of Israel down the barren Sinai Peninsula to the place where God split the Red Sea. Once across the waters, the explorers will tell you the story of how they discovered the trail of the Exodus, including video footage of the Exodus campsites of Marah, Elim, the Wilderness of Sin, the place where Moses touched the rock and water came forth, and finally, the mountain of God, Mount Sinai. The People of Lehi, a new DVD that includes three documentary films by George Potter. Included on the DVD are the documentary films: The People of Lehi, The Tree of Life and the Imagery of the Valley of Lemuel", and The Lands of Noah’s Ark. As one viewer stated, “The film was electrifying”. Other comments included, “Your work is really guided by the spirit” and again and again we heard, “I couldn’t believe what I was seeing.” The new DVD is another amazing witness that the Book of Mormon is a true history and shows again that there is ample evidence in Arabia to prove it. Color, Running Time Approx:1 hour, 54 minutes.